Wipro one of the leading IT Company is providing opportunity for all the students who will be graduating in year 2019 . Wipro is going to conduct this National Level Talent Hunt Test in the month of November 2018. The Notifications for this National level Test will arrive soon to all the colleges, and the registrations for the same may start from 1st week of November 2018. Registration Starts: – From 1st Week of November. Exam Dates :- 16th ,17th ,18th of November 2018. 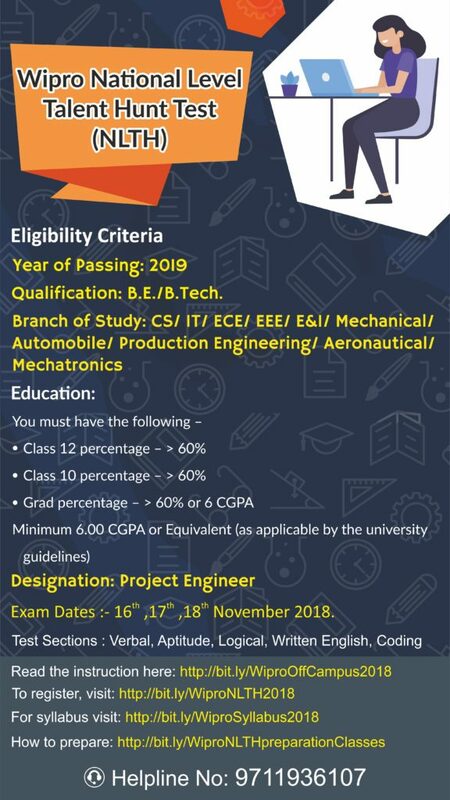 Note that registrations for this will start in 1st week of November as the Exam Dates for NLTH is 16th ,17th and 18th of November, So you start applying as soon as registrations starts. The registrations date is not announced till Now but all the B.Tech colleges around India will soon be notified for this process. 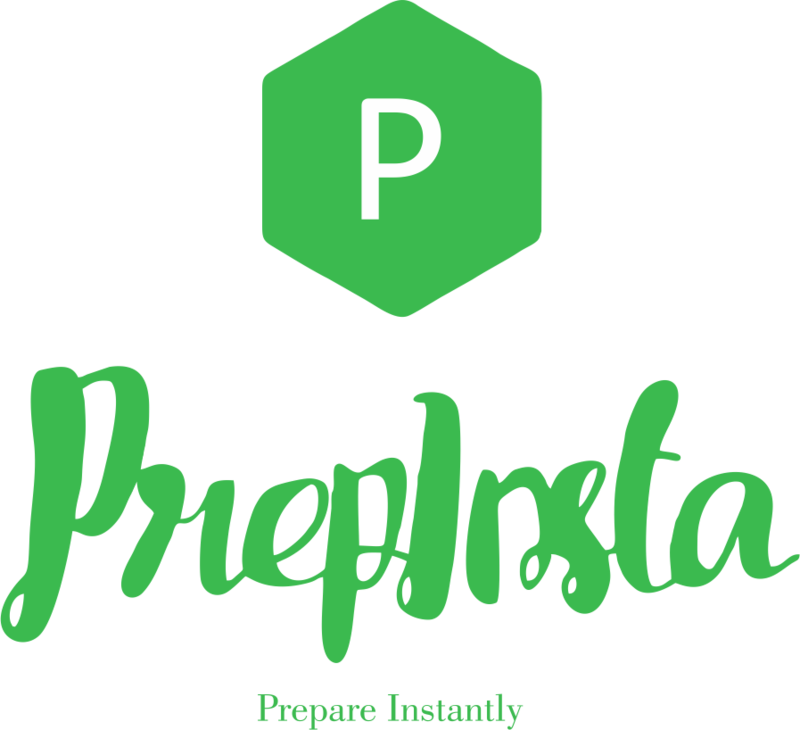 But you need not worry for the registration Date Prepinsta will notify you as soon as the registration date is announced as Prepinsta updates its pages daily for every current placement drive that are happening. 1. a Careers page 2018. 1. b Careers page 2019. You will find an Register Now button for the registration form. After clicking the Register Now button you will be redirected to the registration form. You need to fill that form as per the instructions provided on the form and submit it. After the submission you get a confirmation message stating that you have completed Step 1 successfully. Now fill up the Candidate Application Manual which is Step 2. Once you attend the drive, within 10-15days you will be given an update about the selection/rejection to Wipro. If you fail to clear a Wipro hiring process once, then you can’t attend any other Wipro recruitment drive for the next 6 months. However, recheck it once before applying. After my engineering when I was searching for job a friend of mine suggested me to take AMCAT test as Wipro hiring occurs on the basis of AMCAT scores. So, I immediately applied for AMCAT by registering on www.aspiringminds.com. I got my admit card and the test center details. For preparation I referred many competitive books and aptitude test papers. I also referred to PrepInsta for the solved and unsolved previous year Wipro papers. The AMCAT paper had two rounds. For the first round I had to go to the test centre. In the second round, we were allowed to take test from our home. In the Quantitative Analysis section, there were 16 questions and the time limit for this section was 16 minutes. The questions were related to basic mathematics such as H.C.F. &L.C.M., Probability, Divisibility, Permutation and Combination. In the Logical Reasoning and Data Interpretation section, there were 22 questions and the time limit for this section was 22 minutes. There were questions related to Data Sufficiency, Logical Word Sequence, Objective Reasoning, Directional Sense, and Selection Decision Tables. In the Verbal section, there were 25 questions and the time limit was also 25 minutes. There were four Reading comprehensions, and questions on synonyms, antonyms, tenses, subject-verb agreement questions. Since I had the option to take the test at home I appeared for the second round from my home. 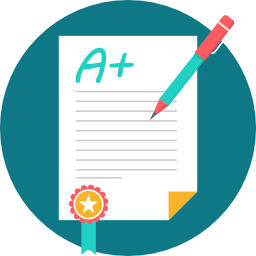 There were again two sections in this round, Wipro Coding Test, and the Written English Test. Wipro Coding Round – In this round, there was an option between the coding question and the MCQ programming question, since I was from a non-computer science branch, I chose the MCQ programming section. There were four questions in which codes were given, and I had to find errors or output. Written English – In this section I had to the write an essay on “Should Euthanasia be kept or banned?” The time limit for this section was of 20 minutes. The only point to remember in this section was that there should not be any errors in the article. The result of the AMCAT paper was declared after 14 days on my registered email id. I scored an average of 79 %. I filled the form for the Wipro off-campus drive. I submitted my test scores and was waiting for the results. After one week I received an email informing that I have been shortlisted for the next of the Wipro interview process. Since I was from a noncomputers background, the interviewer asked me about what was my favorite subject during engineering. I was quite sure about the concepts of the microprocessor. The interviewer asked me many questions related to the topic, and I was not able to answer all of them correctly. The interview didn’t go well according to me. I was asked to wait outside till all the interviews are over. Finally, the list of the selected candidates was announced and unfortunately my name was not on the list. Nevertheless, I would advice that brush up your concepts prior to the interview so that you don’t miss any opportunity.